Lost Footsteps | Romans in Myanmar? In 121 AD an embassy crossed into the Chinese Han Empire from what is today Myanmar and was taken to the then capital Luoyang. The embassy may have been from a Myanmar ruler, but may also have come from further west. The embassy was accompanied by a troupe of entertainers, including jugglers and acrobats, who performed at the Han imperial court. The Chinese were intrigued by the outlandish entertainers and learned that they were Roman subjects. From exactly where in the Roman empire they came we don't know, possibly Syria or Alexandria. This was a time when the Romans and the Chinese were beginning to be aware of each others existence, though no direct official contact had yet been made. The Romans were then sailing through the Red Sea to ports in India and onwards to present day Myanmar. Myanmar was known for its gold, ivory, sandalwood and cinnamon. Romans merchants sold clothes, wine, glassware, olive oil, and slaves. The route onwards by sea around what is now Singapore would would not be mastered by the Romans for several more decades. For a brief moment, Myanmar was on the highway of the world, connecting the two greatest empires of ancient times. There may be archeological evidence of Roman visits to Myanmar waiting to be found. (Roman coins from a slightly later date have been discovered in Vietnam). The 2nd century AD in Myanmar was a time of early urbanization and increased trade, both northeast to Han China and southwest across the Bay of Bengal. Writing systems and religious ideas were imported around then from South India to Tibeto-Burman speaking peoples living in new walled cities. Perhaps these same peoples also enjoyed an occasional glass of Italian wine. The first image is of a Roman sailing ship, the kind that may have arrived at ports in today's lower Myanmar nearly 2,000 years ago. 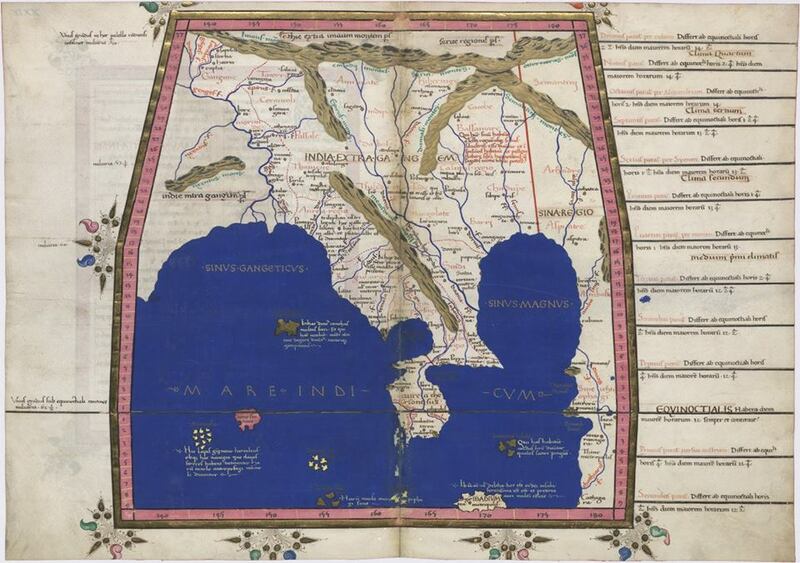 The second image is a 16th c. map of Asia based on Ptolemy's Geography of 150 A.D. What is today Myanmar is clearly detailed at the centre.